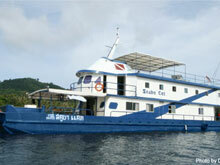 The most stable dive platform: MV Scuba Cat, Similans, Thailand! Phuket Liveaboards on the MV Scuba Cat, the most "friendly" liveaboard to be found...seasickness is rare. 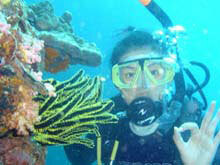 Learn to Dive, Snorkling, Kids Adventure, Certified Divers, TecRec or Go Pro, the choice is yours. Our relaxed 10 days course gives our candidates the opportunity to study at their own pace. Why not start your journey to become a Dive Instructor by doing your PADI IDC Dive Instructor Training with Scubacat in Phuket. 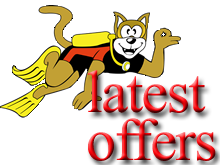 For Liveaboards MV Scuba Cat is an ideal scuba diving platform. Her design gives stability that is only found in a very large catamaran liveaboard. She operates amongst the protected waters of the Similan Islands making this the most "friendly" liveaboard to be found...seasickness is rare. From only 12,000 Baht per person. Get with the Scubacat community!